Chancellor Angela Merkel and the Emir of Qatar, Tamim bin Hamad bin Khalifa al Thani. The Gulf state of Qatar said on Friday it would invest €10 billion to strengthen its ties with Germany over the next five years, including the possible creation of a liquefied natural gas (LNG) terminal. Qatar's Emir Tamim bin Hamad al-Thani announced the funding boost for its long-term trading partner and Europe's largest economy at a bilateral investment conference in Berlin. Germany is Europe's biggest energy consumer. The latest investment pledge comes on top of €25 billion Qatar has already invested in key German companies such as Volkswagen AG, Siemens AG, Deutsche Bank and others. 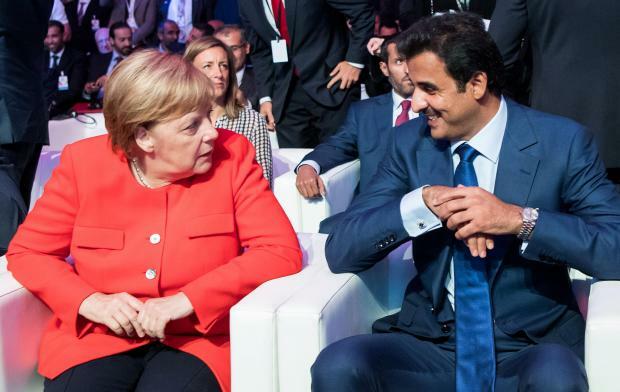 "To express our trust in the strength of the German economy and the importance of investing in it, I announce the intention of Qatar to pump investments that amount to €10 billion into the German economy in the next five years," al-Thani said. He said the overall volume of German-Qatari trade had dipped slightly in 2017 after doubling to around €2.8 billion, but he expected further growth in coming years. German Chancellor Angela Merkel said the energy sector offered promising opportunities to expand business ties, adding that Qatar's LNG supplies would help diversify supply sources. "From my point of view, the energy sector in particular offers considerable potential to expand our economic ties," Merkel told the emir and other conference participants. Qatar's energy minister Mohammed al-Sada on Thursday threw his support behind the possible cooperation of Qatar Petroleum, the world's top supplier of LNG, in the project. On Wednesday Qatar Petroleum said it was in talks with Germany's RWE and rival Uniper about the potential LNG terminal. Christian Sewing, chief executive of Deutsche Bank, underscored close ties with Qatar - which holds a 6.1 per cent stake in the German bank - had helped give the bank room to restructure and "do its homework."